Although it wasn't until the middle of the 20th century that engineering programs officially began opening up to women, some found ways to develop knowledge and skills that gave them a chance to pursue their interests despite major hurdles. Catherine Anselm Gleason (1865‐1933), the oldest child of machine shop owner William Gleason and his second wife Ellen McDermott Gleason, was one of those. Known as Kate, she began reading books about machines and engineering at a young age. When her older half-brother, who had been helping her father in the shop, died of typhoid, she stepped in at age 11 to fill his shoes when she wasn't in school. Some biographers say one reason she didn't meet resistance from her father was because one of her mother's close friends was women's rights' advocate Susan B. Anthony. Continuing the work of her father, she was a pioneer as an independent woman in several ways–as an engineer, as a business person, as a world traveler. She, along with her brothers, took William Gleason's machine shop to the next level of business, a step toward making Gleason Corp. what it is today. The company is one of the world's top providers of the machines, tooling and technologies needed to produce gears found in everything from vehicles to airplanes, wind turbines to power tools. At age 19, Kate Gleason became the first woman engineering student to enroll in the Mechanical Arts program at Cornell University, but her father's shop in Rochester soon came upon hard times. She was called home and never was able to return to complete the requirements for a degree. However, through training and self-learning she earned the title of engineer and is recognized for her considerable accomplishments. Some of her education came from courses at the Sibley College of Engraving and the Mechanics Institute, which became Rochester Institute of Technology. While still in her 20s, she strengthened her father's business by becoming one of the first American manufacturers to expand to Europe. Today, international sales are a strong component of the company's business. After two younger brothers joined the family business, their older sister left and undertook a range of activities that put her in the world of finance and also left a mark on the development of her Rochester home town. 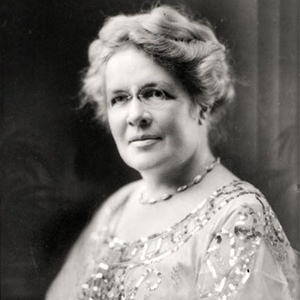 In 1917, when the president of the First National Bank of Rochester resigned to serve the country in World War I, she became the first woman with no family bank ties to become president of a national bank. Her experiences with employees at manufacturing and financial companies sparked an interest in how to provide low-cost housing for workers. Drawing on her engineering skills, she came up with new designs for affordable housing made of concrete based on a new pouring method she developed. She described her methods in an article she wrote for a trade magazine, Concrete, in 1921, titled "How a Woman Builds Houses to Sell at a Profit for $4,000." Her designs became a model for future developments. By 1918, her work had so impressed the American Society of Mechanical Engineers that she was unanimously elected to membership as its first woman member. In later years, she traveled extensively and used her affordable housing concept to undertake business ventures in California and South Carolina. She purchased and restored an estate in France and helped the town recover from the destruction and devastation of World War I. Her impact on engineering, especially for women, continues to be recognized. In 1998, the Kate Gleason College of Engineering at the Rochester Institute of Technology became the first engineering school in the country to be named for a woman. The school also established a Kate Gleason Endowed Chair in 2003 for a professor, who among other qualities motivates women in engineering activities and builds "upon the tradition of Kate Gleason as a role model for women in engineering." In 2011, the American Society of Mechanical Engineers' Foundation established the Kate Gleason Award recognizing the contribution of distinguished female leaders in the engineering profession.